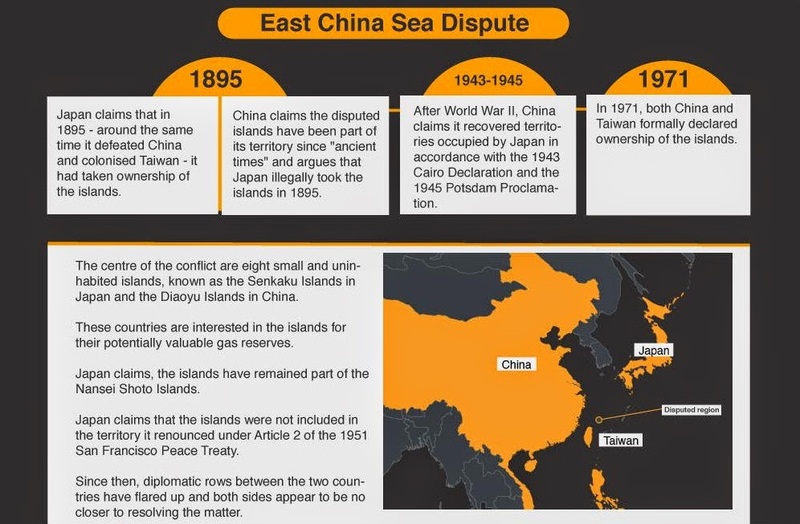 Al Jazeera looks at the dispute over islands in East China Sea and South China Sea between China and its neighbours. Vice-Admiral Robert Thomas of the US Navy (USN) Seventh Fleet said the joint exercises are in line with America's "rebalancing" of forces in the Asia-Pacific and its commitment to freedom of access on the seas in the region. 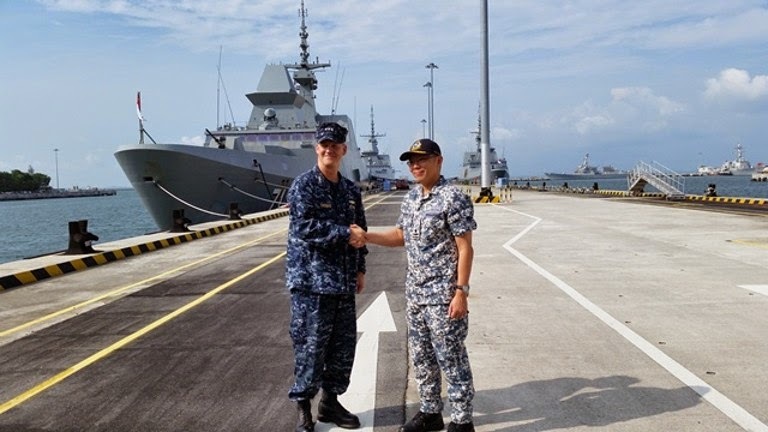 The USN's warships and aircraft will work together with the Republic of Singapore Navy (RSN) and the Republic of Singapore Air Force (RSAF) during the joint exercise. Commenting on the tensions in the South China Sea between China and regional countries such as the Philippines and Vietnam, Vice-Admiral Thomas said while the Chinese Navy will likely carry out further operations there, the USN priorities operational readiness in the region, including offering its resources to aid in humanitarian efforts. He said he "did not want to speculate" on what would warrant US military intervention in the region. A senior Chinese general today (June 1) reiterated China’s strong objections to what he said were ‘provocative’ remarks by Japanese Prime Minister Shinzo Abe and United States Defense Secretary Chuck Hagel against China, as he issued a strongly-worded defense of Beijing’s actions in the disputed islands of the South China Sea. Departing from his prepared speech at the final day of the Shangri-la Dialogue annual security summit, Lieutenant General Wang Guanzhong, a deputy chief of General Staff from the China’s People’s Liberation Army, said he was taken aback by the remarks made by Mr Abe and Mr Hagel over the previous days and accused them of staging provocative actions against China. “The speeches made by Mr Abe and Mr Hagel gave me the impression that they coordinated with each other. They took advantage of speaking first at the Shangri-la Dialogue and staged provocative actions and challenges against China,” he told the forum. A senior Chinese general has hit back at a “provocative challenge” from the United States and Japan, denouncing criticism of Beijing’s handling of a spate of escalating territorial disputes in the region. The countries squared off in a war of words that at times overshadowed an Asian security forum over the weekend and also highlighted the potential for the Abbott government’s close defence ties with Washington and Tokyo to anger its largest trading partner, China. Lieutenant General Wang Guanzhong, the People’s Liberation Army’s deputy chief of general staff, said on Sunday that his delegation at the annual Shangri-La Dialogue security summit in Singapore was surprised by what appeared to be a coordinated and staged “provocative challenge against China”. 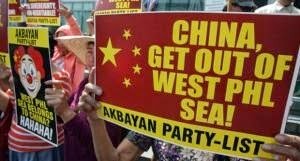 The relations between China on the one hand and Japan, the US, Philippines, Vietnam, and other members of ASEAN have entered troubled waters over territorial disputes involving the Paracels and Spratlys islands as well as the East China Sea. While China has claimed a large swathe of the South China Sea and islands on the East China Sea for itself. It has recently claimed an air defense zone over the East China Sea, issued passports that depict the disputed Paracels are part of its territory, and introduced an oil rig close to the Paracels. These moves have led to many skirmishes between Vietnam and China. 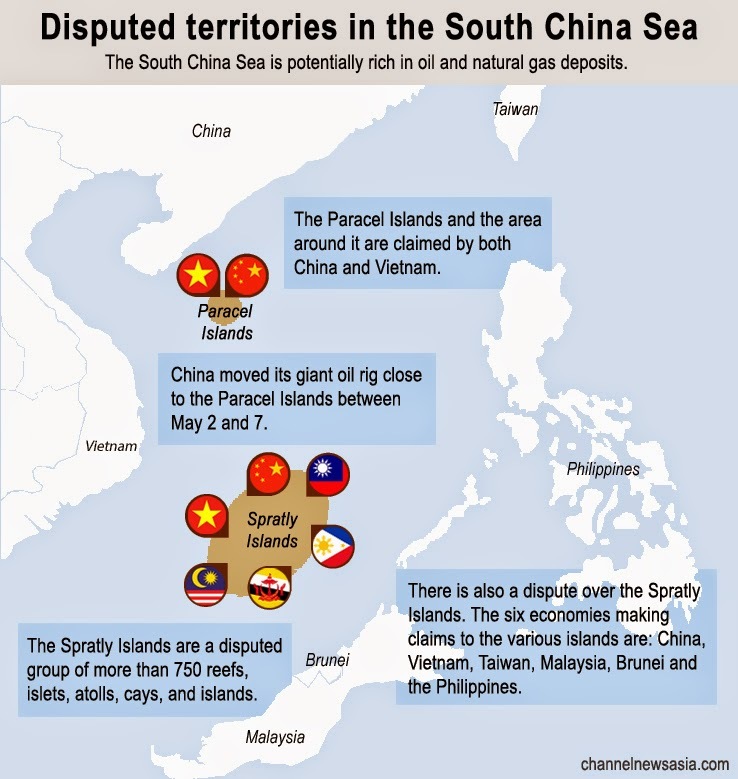 While most of the Paracels and Spratlys in the South China Sea and the Scarborough Shoal claimed by the Philippines are uninhabited, many countries lay claim to them because of the possible presence of natural gas and oil under and around the islands. Both Japan and the US have spoken up against China’s aggressive moves at the Shangri-La Dialogue in Singapore. "In recent months, China has undertaken destabilizing, unilateral actions asserting its claims in the South China Sea," Hagel said. The United States and China squared off at an Asian security forum on Saturday, with the U.S. defense secretary accusing Beijing of destabilizing the region and a top Chinese general retorting that his comments were "threat and intimidation". Using unusually strong language, U.S. Defense Secretary Chuck Hagel took aim at Beijing's handling of territorial disputes with its Asian neighbors. China struck back harshly at the United States and Japan on Saturday, as a senior Chinese military official accused Secretary of State Chuck Hagel and Prime Minister Shinzo Abe of Japan of acting in concert to sow controversy and division in the Asia-Pacific region. Speaking to reporters at a conference here of senior military officials from around the region, Lt. Gen. Wang Guanzhoung, the People’s Liberation Army’s deputy chief of staff, characterized a speech Saturday morning by Mr. Hagel, which followed one by Mr. Abe Friday night, as “full of threats and intimidating language,” according to Chinese news media outlets. General Wang seemed especially annoyed that Mr. Hagel, who accused China of coercive tactics in its very many maritime disputes with its neighbors, had made his accusations at a conference about regional cooperation. U.S. "will not look the other way" when nations such as China try to restrict navigation or ignore international rules and standards. China's territorial claims in the South China Sea are destabilizing the region, and its failure to resolve disputes with other nations threatens East Asia's long-term progress, Hagel said. Later, a top Chinese general took issue with Hagel's comments during a brief meeting with the Pentagon chief. Prime Minister Shinzo Abe emphasized the importance of “the rule of law” in the oceans in his speech at the Asia Security Summit, which started Friday in Singapore, apparently eyeing China’s provocative actions in the East China Sea and the South China Sea. In the speech at the meeting, which was organized by Britain’s International Institute for Strategic Studies, Abe expressed an intention to help member countries of the Association of Southeast Asian Nations (ASEAN) strengthen their ocean surveillance capabilities. Abe also said Japan will provide 10 new patrol boats to the Philippines. China and other countries in the Asia-Pacific region are concerned about the further consolidation of U.S.-Japan alliance which has been mentioned again and again in a lot of international, multilateral events including the ongoing Shangri-La Dialogue, a senior Chinese officer said Saturday. The remarks were made by Wang Guanzhong, deputy chief of the General Staff of the Chinese People's Liberation Army (PLA) who leads the Chinese delegation at the meeting, after U.S. Secretary of Defense Chuck Hagel made a speech at the meeting in which he made groundless accusations against China. Hagel in his speech also outlined Washington's security priorities in partnership with its allies, claiming to strengthen ties between its allies and "enhance their joint capabilities"
Defense Secretary Chuck Hagel warned an international security conference Saturday that the U.S. "will not look the other way" when nations such as China try to restrict navigation or ignore international rules and standards. As Southeast Asia scrambles to cope with China’s assertiveness in maritime disputes, Japanese leaders are offering themselves to the region as a strategic counterweight to Beijing. Speaking at the annual Shangri-La Dialogue security summit in Singapore on Saturday, Japanese Defense Minister Itsunori Onodera became the latest senior Japanese official to call for greater cooperation between Japanese and Southeast Asian militaries, particularly in areas like humanitarian assistance and disaster-relief operations. A naval confrontation between China and Vietnam over Chinese attempts to anchor a giant oil rig in disputed waters is by far the most serious episode in recent years between the two historically entwined neighbors. 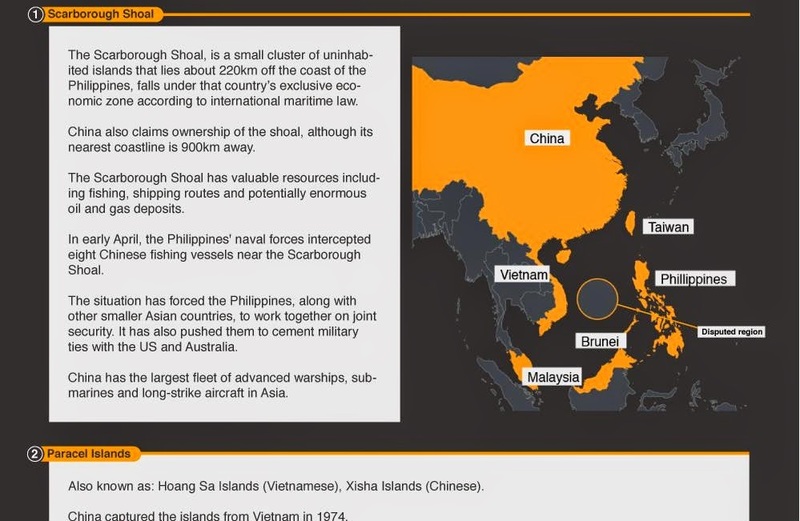 Unlike the Philippines, which has launched a simultaneous challenge to China's assertive behavior in the South China Sea by detaining a Chinese fishing boat and its crew, Vietnam has a potent military. To be sure, the Vietnamese navy—much of it dating from the Soviet era—is no match for China's modern fleets. As far back as 1974, Chinese forces were able to grab the Paracel Islands off Vietnam's coast, and another skirmish in the area in 1988 led to the deaths of dozens of Vietnamese sailors. The two countries have the most extensive claims among the disputing parties to the South China Sea and its rich natural resources. 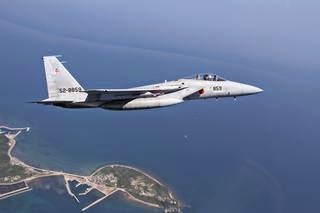 Japan and ASEAN nations recently called for freedom of the skies and high seas. It is the latest chapter in territorial disputes with China which pose significant risks to regional stability, says analyst Rajiv Biswas. During a three-day summit over the weekend (December 13-15) leaders of Japan and the 10-member Association of Southeast Asian Nations (ASEAN) pledged to boost economic and security ties. But they also issued a joint statement where they "agreed to enhance cooperation in ensuring freedom of overflight and civil aviation safety." While China wasn't mentioned, the statement was seen as a rejection of China's recently declared air defense zone which includes the disputed Senkaku/Diaoyu islands. Beijing has territorial disputes not only with Japan but also with four members of the economic bloc. In a DW interview, the chief Asia economist of the analytics firm IHS, Rajiv Biswas, says the disputes pose a major risk to regional political stability in Asia as well as to the Asian regional economy due to the large volume of trade flows. WASHINGTON - In an era when the Obama administration has been focused on new forms of conflict - as countries use cyberweapons and drones to extend their power - the dangerous contest suddenly erupting over a pile of rocks in the East China Sea seems almost a throwback to the Cold War. Suddenly, naval assets and air patrols are the currency of a shadow conflict between Washington and Beijing that the Obama administration increasingly fears could escalate and that American officials have said could derail their complex plan to manage China’s rise without overtly trying to contain it. As in the Cold War, the immediate territorial dispute seems to be an excuse for a far larger question of who will exercise influence over a vast region. Territorial disputes are escalating in East Asia with China stepping up its push for maritime interests despite strong protests from its neighbours and dampening the mood for regional cooperation for stability. China's demarcation last week of its expanded air defence identification zone overlapped with those of South Korea and Japan. The two countries berated Beijing for having drawn the zone without any consultation. East Asia this year has been marked by rising tensions over the Senkaku Islands (known in China as the Diaoyu Islands). 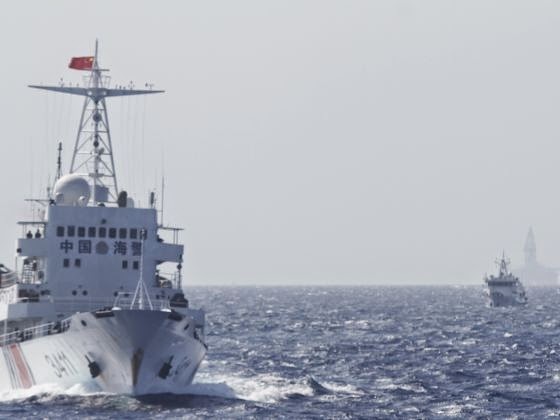 As has been widely reported, China has dispatched government patrol and surveillance ships to intrude into Japan’s territorial waters off the islands, which lie in the East China Sea. Meanwhile, Beijing’s rhetoric has been more heated. 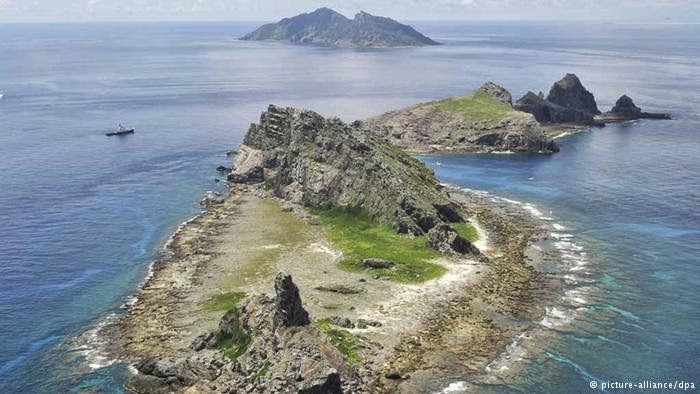 In April, a Chinese Foreign Ministry spokesperson appeared to indicate that the Chinese government regarded the Senkaku Island issue as a core interest for China. This was the first government use of a term normally reserved for highly sensitive Chinese political concerns such as Taiwan, Tibet and the Xinjiang Uyghur Autonomous Region. And in recent days, China has made the very provocative decision to establish an air defense zone that encompasses the Senkaku skies. 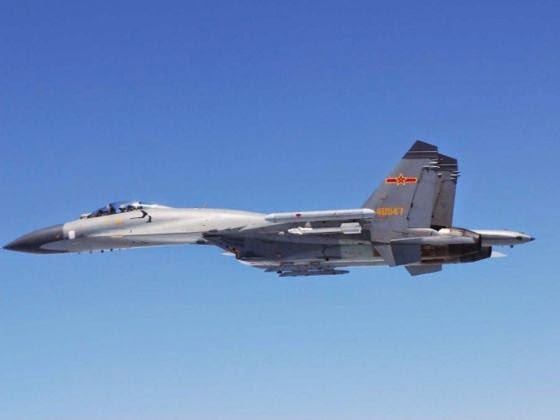 Japan and China yesterday accused each other’s air forces of dangerous behaviour over the East China Sea, with Japan saying Chinese aircraft had come within a few dozen metres of its warplanes. Japan’s Defence Minister accused Beijing of going “over the top” in its approach to disputed territory. China’s Defence Ministry said Japanese planes had carried out dangerous actions during its joint maritime exercises with Russia. As the world moves into the second decade of the 21st century, a new power rivalry is taking shape between India and China, Asia’s two behemoths in terms of territory, population and richness of civilization. India’s recent successful launch of a long-range missile able to hit Beijing and Shanghai with nuclear weapons is the latest sign of this development. This is a rivalry borne completely of high-tech geopolitics, creating a core dichotomy between two powers whose own geographical expansion patterns throughout history have rarely overlapped or interacted with each other. Despite the limited war fought between the two countries on their Himalayan border 50 years ago, this competition has relatively little long-standing historical or ethnic animosity behind it. The signal geographical fact about Indians and Chinese is that the impassable wall of the Himalayas separates them. Buddhism spread in varying forms from India, via Sri Lanka and Myanmar, to Yunnan in southern China in the third century BC, but this kind of profound cultural interaction was the exception more than the rule. An unrepentant China on Friday defended its actions in disputed Asian waters amid warnings of war with Vietnam, as Washington voiced "serious concern" after riots left two Chinese workers dead and more than 100 injured. Vietnam has been shaken by its worst anti-China unrest in decades following Beijing's deployment of an oil rig in contested South China Sea waters, which triggered ramming incidents involving Vietnamese and Chinese vessels. As tensions mounted, a top Chinese general warned that Beijing "cannot afford to lose an inch" of what it considers its territory. A top Chinese general vowed on Thursday his country would protect an oil rig in waters contested by Hanoi and ensure that it continued to operate despite angry protests in Vietnam. "What we're going to do is ensure the safety of the oil rig and ensure the operation will keep going on," General Fang Fenghui, chief of the general staff of the People's Liberation Army, told a news conference after talks at the Pentagon. Vietnam had sent in ships to try to disrupt the drilling, he said through an interpreter, "and that is something that we are not able to accept." Vietnam’s Prime Minister yesterday called on the world to condemn China for causing what he called an extremely dangerous situation in a disputed area of the South China Sea. 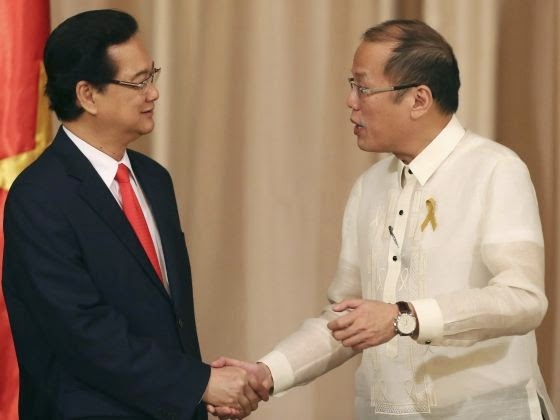 In a rare public show of unity, Mr Nguyen Tan Dung, standing beside Philippine President Benigno Aquino after they held talks in Manila, said both countries would strengthen defence cooperation and were determined to oppose Chinese violations of international law. Mr Dung cited Beijing’s deployment of an oil rig on May 1 in waters near the Paracel Islands also claimed by Hanoi, saying China’s moves had seriously threatened peace. Early Wednesday, protesters began looting and burning factories at industrial parks near Ho Chi Minh City, in what is being called the worst outbreak of public disorder in Vietnam for years. Up to 20,000 people had been involved in relatively peaceful protests on Tuesday in Binh Duong province, according to the Associated Press, but smaller groups of men later ran into foreign-owned factories and caused mayhem. Although some of the factories were owned by companies from Taiwan and South Korea, they were not thought to be the real target of the protesters' anger. 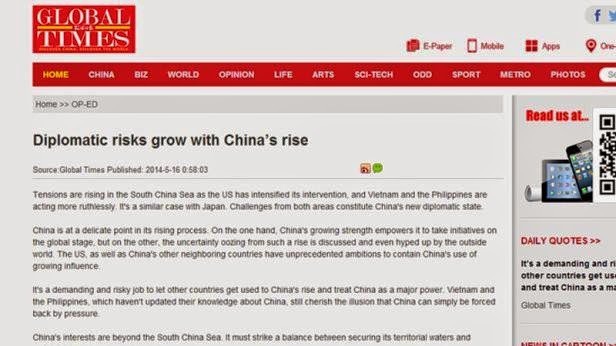 That prize belongs to China and its now-infamous "nine-dash line." The protests were sparked when Beijing deployed an oil rig in waters claimed by Vietnam on May 1. The Haiyang Shiyou 981 now sits about 70 miles inside the exclusive economic zone (EEZ) that extends 200 miles from the Vietnamese shore as part of the 1982 U.N. Convention on the Law of the Sea. A top Chinese general vowed Thursday his country would protect an oil rig in waters contested by Hanoi and ensure that it continued to operate despite angry protests in Vietnam. "What we're going to do is ensure the safety of the oil rig and ensure the operation will keep going on." 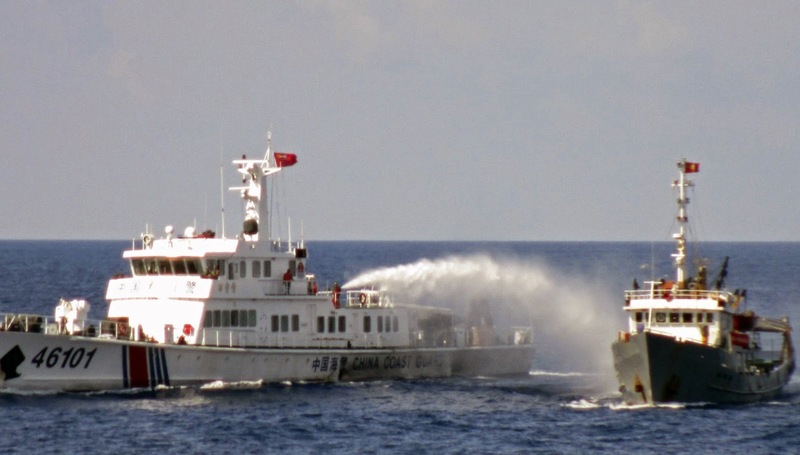 China acknowledged on Thursday it had used a water cannon against Vietnamese vessels in a dispute in the South China Sea, but denied that Chinese Navy ships were present. The official, Yi Xianliang, deputy director general of the department of boundary and ocean affairs, said China had dispatched government and civilian vessels to the area, not military, and he dismissed a question from a reporter about whether Chinese Navy boats were present as “unprofessional.” He declined to say how many ships China had dispatched. China insisted yesterday it had every right to drill for oil off Vietnam’s coast and warned its neighbour to immediately leave the area around the deep-sea rig where Chinese and Vietnamese ships are engaged in a tense stand-off. China insisted Thursday it had every right to drill for oil off Vietnam's coast and warned its neighbor to leave the area around the deep-sea rig where Chinese and Vietnamese ships are engaged in a tense standoff. The stalemate underlines the apparently intractable nature of many of China's territorial disputes with its neighbors and the ship standoff -- with both sides accusing the other of ramming ships -- has raised the possibility of a conflict in the South China Sea's most serious incident in years. China has sharply responded to US comments regarding the oil rig Beijing is setting up in the South China Sea. The $1 billion rig sparked a new row with Vietnam blaming China for intentionally ramming its vessels in a disputed area. "The United States has no right to complain about China's activities within the scope of its own sovereignty," Foreign Ministry spokeswoman Hua Chunying said at the daily briefing on Wednesday. The statement was made in response to the US State Department spokeswoman Jen Psaki’s comment in which she criticized “China's decision to operate its oil rig in disputed waters” and called it“provocative and unhelpful to the maintenance of peace and stability in the region. Tensions are rising in Southeast Asia as Vietnam claims two of its ships were rammed by Chinese vessels in disputed waters. The row shows China is hardening its stance on maritime disputes, says analyst Gregory Poling. The confrontation began on May 2 when the state-owned China National Offshore Oil Corporation placed its deep sea drilling rig HD-981 in disputed waters of the South China Sea. As Vietnam objected, China deployed some 80 ships, including seven military vessels, along with aircraft to support the rig. Hanoi reacted by dispatching 29 ships to attempt to disrupt the rig's placement and operations. The situation escalated five days later, when Hanoi reported Chinese vessels used water cannon and rammed several Vietnamese patrol ships, injuring six crew members and damaging some of the ships. China claims a large part of the South China Sea and rejects rival claims from Vietnam, the Philippines, Taiwan, Malaysia and Brunei. In a DW interview, Gregory Poling, a fellow with the Sumitro Chair for Southeast Asia Studies at the Washington-based Center for Strategic & International Studies (CSIS) says the incident is likely to increase solidarity amongst ASEAN members. But it also shows that Beijing is determined to change the status quo in the South China Sea - regardless of the complaints or actions of neighboring states. Less than a week after President Obama's Asian Reassurance Tour, Beijing offered its rejoinder, sending a flotilla of 80 military and civilian ships to install China's first oil rig in disputed South China Sea waters, well within Vietnam's 200-mile exclusive economic zone. When some 30 Vietnamese naval vessels demanded the rig's withdrawal on Sunday, China's ships responded by ramming several of the Vietnamese boats and injuring six sailors. This skirmish hasn't escalated to gunfire or attempted boarding, but the two sides are still facing off at sea. "Vietnam has exercised restraint," said a senior Vietnamese commander Wednesday, "but if Chinese vessels continue ramming Vietnamese ships, we'll have to act out of self-defense." Beijing said Thursday it would negotiate only if Hanoi's ships leave the site. The Foreign Ministry says the $1 billion rig—located 225 miles south of mainland China and only 120 miles east of Vietnam—is "normal and legal." 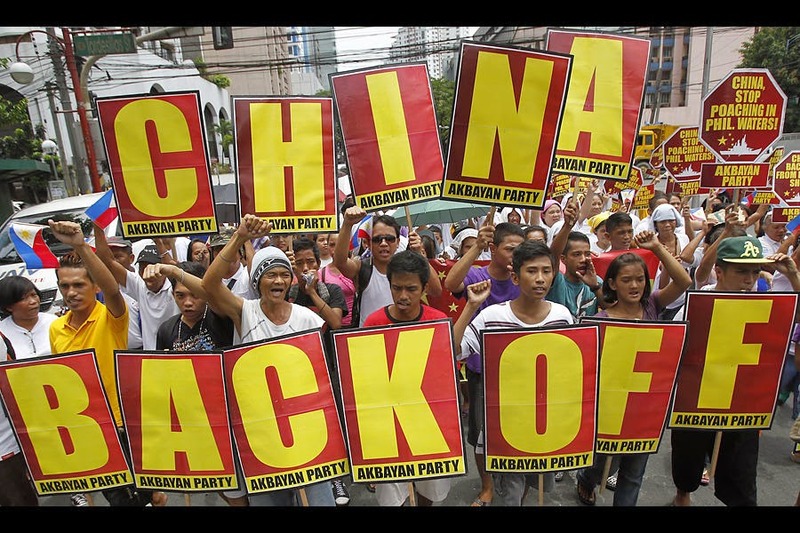 The truth is that this is China's latest attempt to revise the East Asian status quo through intimidation and force. China claims sovereignty over some 90% of the 1.35-million-square-mile South China Sea, and it is staking that claim by flexing its muscle around the sea's outer reaches. Along the eastern edge, China seized Scarborough Shoal from the Philippines in 2012. 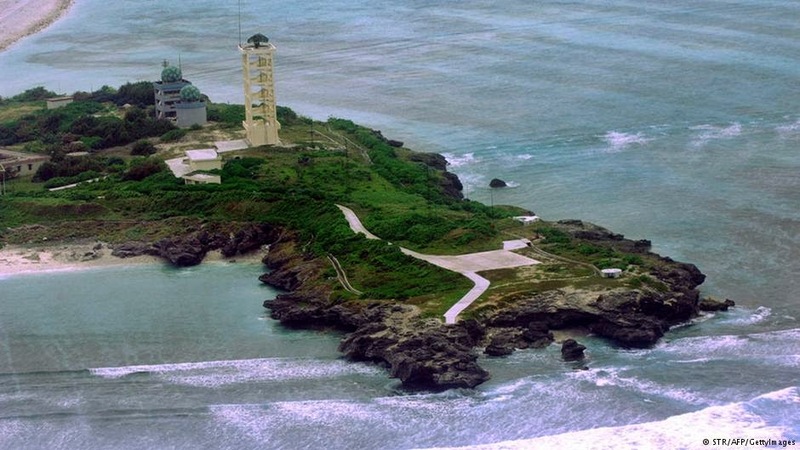 Since March it has blockaded Philippine Marines on Second Thomas Shoal. The US gave a strong warning to China not to escalate territorial tensions in the Asia-Pacific region if it doesn’t want to face American retaliation. In his statement, a US official used sanctions on Russia over Crimea’s accession as an example. Although it’s difficult to gauge China’s response at this point, more pressure needs to be brought to bear for them to abide by diplomatic principles for settling territorial disputes, came the advice from the US assistant secretary of state for East Asia, Daniel Russel, speaking to a meeting of the Senate Foreign Relations Committee. Regarding how to make China comply, the top official had a ready solution, saying that the recent sanctions imposed by the US and EU on Russia should have “a chilling effect on anyone in China who might contemplate the Crimea annexation as a model,” Reuters reports. China has towed a deep sea drilling rig to a spot off Vietnam's coast in waters claimed by both. The rig has been escorted by a reported 70 Chinese craft that have rammed Vietnamese ships and fended them off with water cannons, raising tensions between the nations to their highest in years. Why is China doing this? 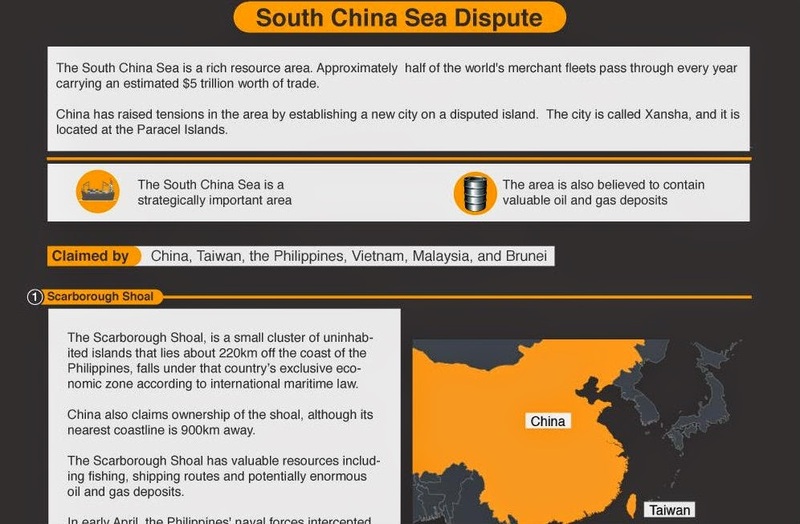 A: China claims virtually the entire South China Sea and has begun acting on announced plans to drill for what is thought to be a wealth of oil and natural gas beneath those waters. The moves may also be a test of Vietnam's ability and resolve to defend its own claims, along with Washington's insistence on freedom of navigation there. Where is the rig? 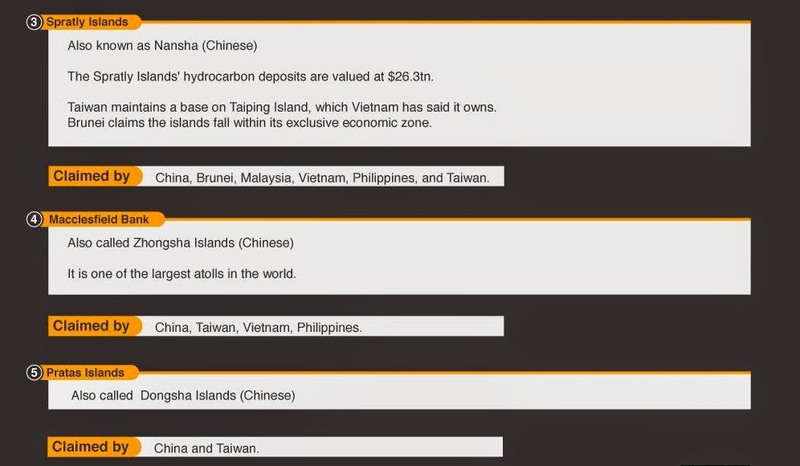 A: China has placed its oil rig about 130 nautical miles off Vietnam's coast in waters already identified by Hanoi for exploration but not yet offered to foreign petroleum companies. Vietnam argues the territory is clearly within its continental shelf. China's argument is based on its historic claim to most of the South China Sea and on the rig's proximity to nearby Paracel Islands, which are also disputed. Two weeks ago on his trip to Asia, President Obama drew another red line, declaring that a group of islands, claimed by both Japan and China, were covered by America’s security treaty with Japan. In the Philippines, Obama inked a 10-year agreement to increase U.S. forces there. The Chinese don’t appear to believe him. This week Beijing decided to assert its aggression in the region. China’s decision to introduce an oil rig accompanied by numerous government vessels for the first time in waters disputed with Vietnam is provocative and raises tensions. This unilateral action appears to be part of a broader pattern of Chinese behavior to advance its claims over disputed territory in a manner that undermines peace and stability in the region. We are also very concerned about dangerous conduct and intimidation by vessels operating in this area. We call on all parties to conduct themselves in a safe and professional manner, preserve freedom of navigation, exercise restraint, and address competing sovereignty claims peacefully and in accordance with international law. Sovereignty over the Paracel Islands is disputed; this incident is occurring in waters claimed by Vietnam and China near those islands. These events highlight the need for claimants to clarify their claims in accordance with international law, and to reach agreement on appropriate behavior and activities in disputed areas. 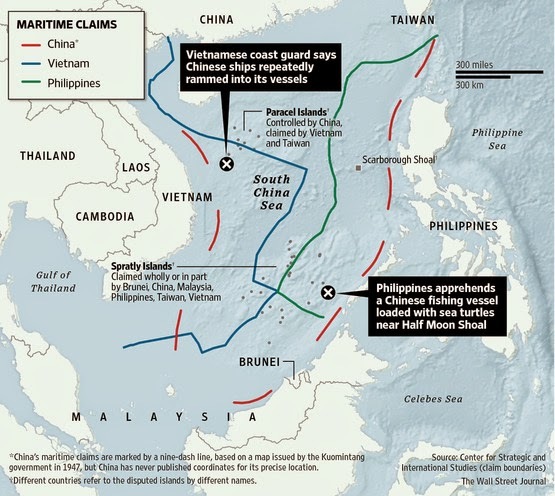 Supposedly fraternal ties between China and Vietnam failed to keep hostilities from bubbling to the surface this week, when vessels from both nations tangled near a Chinese oil rig that Hanoi claims is planning to illegally drill into the country’s continental shelf. 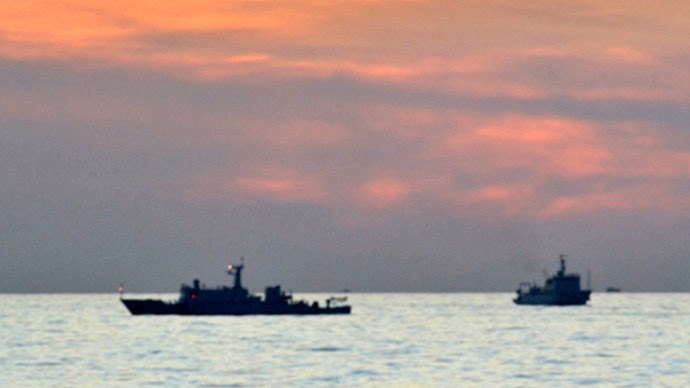 At least six people were injured during the skirmish on May 7, after Chinese vessels used water cannon on, and rammed into, Vietnamese craft that Hanoi had dispatched to prevent drilling from going ahead. Describing Washington's latest remarks on the South China Sea as "inspiring belligerency," Beijing has reportedly urged US to stop fueling maritime provocation. According to China Daily, China's foreign Minister Wang Yi told Kerry in a telephone conversation that China wanted the US to "stop fueling provocations by relevant parties". Wang said that Beijing urged Washington to stand firmly by its previous commitments, be cautious in words and actions and observe the maritime situation around China in an objective and fair manner. Earlier, US Secretary of State John Kerry had said that China's use of an oil rig in its territorial waters was provocative. Beijing claims a U-shaped swathe of the South China Sea that covers areas other South East Asian nations say are their territory. US State Department spokeswoman Jen Psaki said, referring to a telephone call between the US secretary of state and Foreign Minister Wang Yi, according to South China Morning Post report. U.S. Vice President Joe Biden has told a top Chinese military official that Beijing's actions the South China Sea are dangerous and provocative. Biden met in Washington Thursday with the Chinese military's chief of staff, General Fang Fenghui. Biden told Fang that China cannot undermine security and peace. US Vice President Joe Biden voiced "serious concern" Thursday about Beijing's actions in the disputed South China Sea, as a top Chinese general vowed to protect an oil rig that has triggered deadly protests in Vietnam. 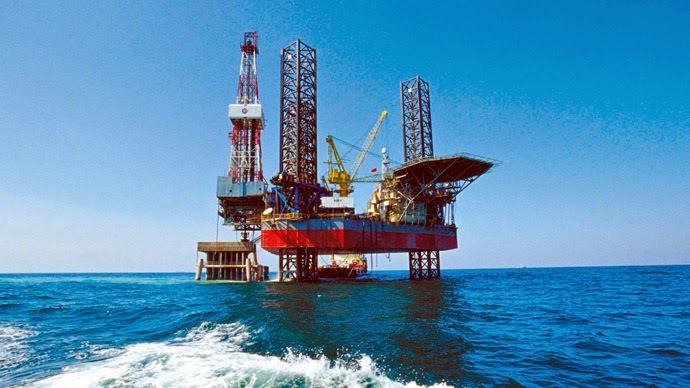 Tensions between China and Vietnam flared earlier this month after Beijing moved the deepwater drilling rig into waters that Hanoi claims and a Chinese worker was killed and at least 149 people injured when a riot broke out this week in Vietnam's central Ha Tinh province. China accused Hanoi of acting in concert with protesters who hit the streets in major Vietnamese cities, mobs torching foreign-owned factories, as long-simmering enmity between the communist neighbors boiled over on the streets. Vice President Joe Biden is conveying America’s objections about China’s behaviour in a territorial dispute with Vietnam to the top brass of the Chinese military. Biden met Thursday with Fang Fenghui, the military’s general chief of staff. The White House says Biden told Fang the U.S. was seriously concerned about China’s unilateral actions. Biden told Fang the U.S. doesn’t take a side in the territorial confrontation between the two countries over an area in the South China Sea. That’s where China has triggered protests in Vietnam by deploying an oil rig in the long-disputed seas. One person has been killed, a Chinese worker in Vietnam. A top Chinese general visiting the United States on Thursday defended the deployment of an oil rig that has inflamed tensions in the disputed South China Sea and triggered deadly protests in Vietnam. Gen. Fang Fenghui blamed Hanoi, and said China cannot afford to "lose an inch" of territory. Fang also blamed President Barack Obama's strategic "pivot" to Asia, as Vietnam and China grapple with one of their worst breakdowns in relations since the two countries fought a brief border war in 1979. 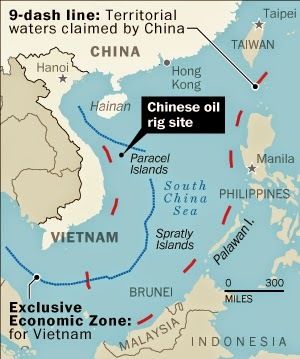 Anti-China broke out in Vietnam after China towed an oil rig into waters claimed by both countries. Up to 21 people have been killed in the riots, and a large foreign steel project has been set ablaze. China's top military leader blamed the Obama administration's new focus on Asia on Thursday for various disputes in the East and South China seas, saying "some neighboring countries" are using it as a chance to provoke problems. Speaking to reporters at the Pentagon, People's Liberation Army's Chief of the General Staff Gen. Fang Fenghui also warned Thursday that the U.S. must be objective about tensions between China and Vietnam or risk harming relations between Washington and Beijing. He defended China's deployment of an oil rig in the South China Sea and said Beijing has no intention of abandoning the drilling despite the violent protests it has spawned in Vietnam. Fang was at the Pentagon to meet with Joint Chiefs Chairman Gen. Martin Dempsey. The session comes on the heels of a mob riot targeting Chinese at a Taiwanese steel mill in Vietnam and anti-China protests over Beijing's deployment of a deep sea oil rig about 150 miles off Vietnam's coast. The recent protests in Vietnam against China's oil rig in a disputed area of the South China Sea highlight the longstanding conflict between the two countries, which share similar cultural roots but where the smaller country fought Chinese hegemony for over 1,000 years, reports our Chinese-language sister newspaper Want Daily. Twenty or more people are reported to have died, including 16 Chinese nationals, in riots over China's drilling operations in close to the Paracel islands claimed by both countries, according to Reuters. Protesters also trashed the factories and facilities of many foreign businesses in Binh Duong and Dong Nai provinces and set many of them ablaze. Yet these are the same provinces where Dr Sun Yat-sen, the founder of the Republic of China, and Vietnamese communist leader Ho Chi Minh are worshiped together at temples. A state-run Chinese newspaper backed the use of “non-peaceful” measures against Vietnam and the Philippines Friday, as it considered the possibility of war in the strategically vital South China Sea. Vietnam is experiencing its worst anti-China unrest in decades following Beijing’s deployment of an oil rig to disputed waters, with at least one Chinese worker killed and more than 100 injured. “The South China Sea disputes should be settled in a peaceful manner, but that doesn’t mean China can’t resort to non-peaceful measures in the face of provocation from Vietnam and the Philippines,” the Global Times newspaper, which often takes a nationalistic tone, wrote in an editorial. “Many people believe that a forced war would convince some countries of China’s sincerely peaceful intentions,” the paper added. US Vice President Joe Biden met a top Chinese military official and expressed America's concerns over China's unilateral actions against Vietnem in South China Sea. Biden expressed his concern when he met the Chinese People's Liberation Army Chief of General Staff Fang Fenghui at the White House yesterday. "The Vice President underscored the United States' serious concern about China's unilateral actions in waters disputed with Vietnam," the White House said. Biden reaffirmed that while the US does not take a position on the competing territorial claims, no nation should take provocative steps to advance claims over disputed areas in a manner that undermines peace and stability in the region, the White House said. "The Vice President and General Fang also discussed the importance of the US-China relationship in the context of addressing a range of regional and global challenges," it said. Earlier yesterday, Nina Hachigian, Nominee to be representative of the US to the Association of Southeast Asian Nations (ASEAN), told lawmakers that the US has a national interest in the unfettered flow of this commerce and in freedom of navigation and overflight in these waters. "Half of the tonnage of the world's ship-based cargo passes through the South China Sea," she said during her confirmation hearing. China's "provocative" actions in maritime disputes with its neighbors are straining ties with the United States, raising questions over how the world's two biggest economies can work together, a senior US official said. The strong comments from Washington on Thursday come after deadly anti-China riots broke out in Vietnam in response to China towing an oil rig into a part of the South China Sea claimed by both Hanoi and Beijing. "This is raising some fundamental questions for us about China's long-term strategic intentions," the US official told Reuters, speaking on condition of anonymity. He said Beijing's move appeared to fit a "pattern" of advancing territorial claims through coercion and intimidation. "China's activities are straining the US-China relationship because it raises questions about our ability to partner together in Asia or even bilaterally." Washington, which this week hosted Chinese General Fang Fenghui, chief of the general staff of the People's Liberation Army, is increasingly concerned about Beijing's growing assertiveness in the resources-rich South China Sea, where several countries and territories have overlapping claims. Biden and Fang met at the White House, where "the vice president underscored the United States' serious concern about China's unilateral actions in waters disputed with Vietnam," his office said in a statement on Thursday. "The vice president reaffirmed that while the United States does not take a position on the competing territorial claims, no nation should take provocative steps to advance claims over disputed areas in a manner that undermines peace and stability in the region." Biden's unusually strong comments were the latest in a string coming out of the US the same day. Tensions are growing over Japanese airspace, with the number of scrambles by Japan Air Self-Defense Force fighters to intercept intruders rising to a 24-year high in fiscal 2013. JASDF fighters were scrambled 810 times, or 2.2 times per day, in the year ended in March, an increase of 243 from the previous year, according to data released by the Defense Ministry in April. That was highest number of scrambles since fiscal 1990, at the end of the Cold War. Of the total takeoffs, 51 percent were to monitor Chinese planes, while 44 percent were to keep an eye on Russian aircraft. Intrusions by Chinese aircraft into Japan's airspace rose sharply to 415 in fiscal 2013, up 35% on the year and the largest number since the ministry began releasing country-by-country data in fiscal 2001. In fiscal 2008, there were just 31 scrambles against Chinese planes; since then, the number has risen 13-fold. Sea turtles, cannons, and arrests: What's going on in the South China Sea? Two incidents over disputed territory in the South China Sea this week threaten to disrupt the tense status quo between China and its Southeast Asian neighbors. In Vietnam, China's dispatch of a state-owned oil rig into waters close to Vietnam sparked a face-off between Chinese and Vietnamese ships and anti-China protests. In the Philippines, China is protesting the detention of a Chinese fishing boat filled with illegal sea turtles and the arrest of its crew. While the region has been home to competing territorial claims for centuries, increasingly assertive action by both China and its neighbors has raised concerns that more serious conflict could erupt. 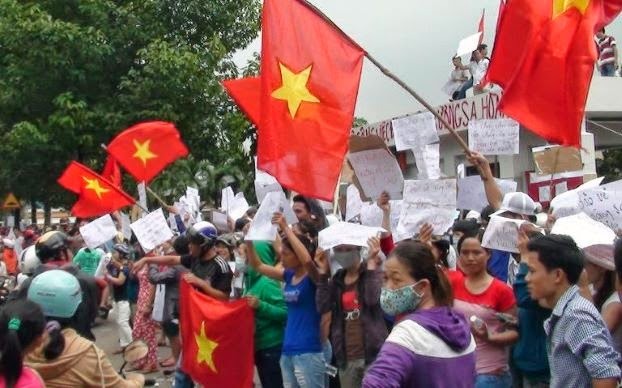 Demonstrations have spread to a third of Vietnam's provinces, with workers attacking Chinese workers and factories, in a wave of nationalist outrage after Beijing moved a deep-water drilling rig into waters claimed by Hanoi. The escalation came despite months of US cajoling for an easing of tensions in the myriad disputes in the South China Sea and a separate conflict between China and US ally Japan in the East China Sea. President Barack Obama has put a high priority on building relations with Southeast Asia, seeing the region as economically dynamic and eager for warmer US relations faced with China's rise. As the dispute escalates between China and its neighbor countries, including Vietnam and the Philippines, over the South China Sea, cause-oriented groups will take to the streets this Friday to protest China’s aggression. US Pinoys for Good Governance (USP4GG), Vietnamese Overseas Initiative for Conscience Empowerment (VOICE), Di Ka Pasisiil Movement, Filipinos Unite, and Akbayan-Youth urged Filipinos to join Vietnamese nationals in a protest against China’s territorial intrusion. Since China deployed a deep-water drilling rig in the disputed South China Sea, protests erupted in Vietnam. “It is with great urgency that I ask the Filipinos to join Vietnamese community here in the Philippines in expressing our anger and disgust at this very, very Hitlerian impetus of China,” Loida Nicolas-Lewis, USP4GG chair, told reporters in a press briefing Wednesday.